Vegan Eats and Treats! : Yummy Eatz & Cookbooklette Winners! Yummy Eatz & Cookbooklette Winners! We've been having a lot of rainy weather and I am loving it so much. The rain helps me feel cozy and makes me feel like I have permission to cuddle up and read and draw and snuggle the pets. It's so nice. It also gives me an excuse to make soup over and over and over again, which is great because that's kinda all I want to do. 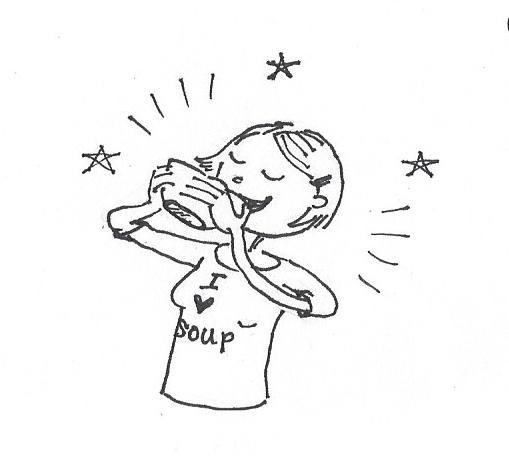 I love soup so much. I made this "Healthy Potato Soup" from the OSG App. I really like that app! I don't use it all that often, but sometimes I just don't want to sift through cookbooks looking for dinner plans, and I like knowing I can always find something healthy and appealing on the app. I almost never eat potatoes, so it was fun to make potato soup. It's got a bunch of fresh spinach in it, which is what turns it so green. 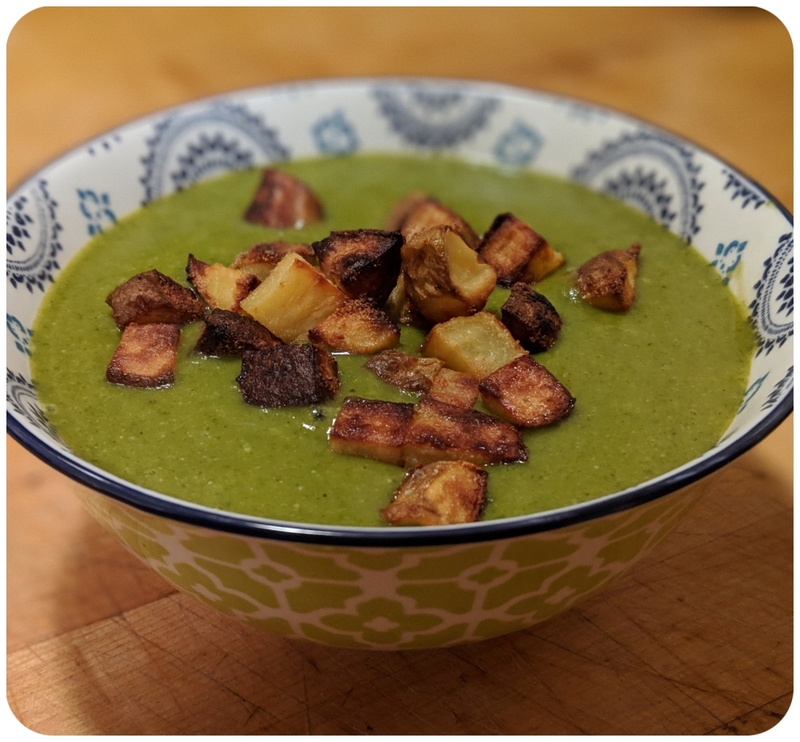 I loved the super smooth and velvety texture of this soup, but my favorite part was the crunchy, seasoned "potato croutons" that were made with roasted potato dice. 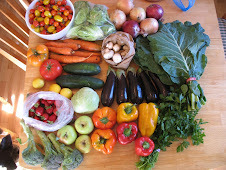 I made a huge batch of borscht, which I guess I was too busy eating to photograph, so I am reusing an old picture. This is the *amazing* recipe from an amazing old cookbook called "Voluptuous Vegan." The really miraculous thing is that Mr VE&T had decided that he "doesn't like borscht" for a while now and it has been causing me great emotional grief. It's funny because he loves beets, but claimed not to like borscht. Meanwhile, I love borscht, but am not totally crazy about plain ol cooked beets. ANYHOW, Mr VE&T reluctantly agreed to try my borscht again, and loved it!! HUZZAH. Let there be borscht!!! This is pretty much a dream lunch for me! The next soup I made, at Mr. VE&T's request was the Tomato Soup with White Beans and Roasted Garlic from Veganomicon. Mr VE&T is pretty much obsessed with tomato soup and rice, and I particularly love this recipe because of the addition of the white beans (a bit more body and protein) and the roasted garlic (2 whole heads! maximum umami oomph!). 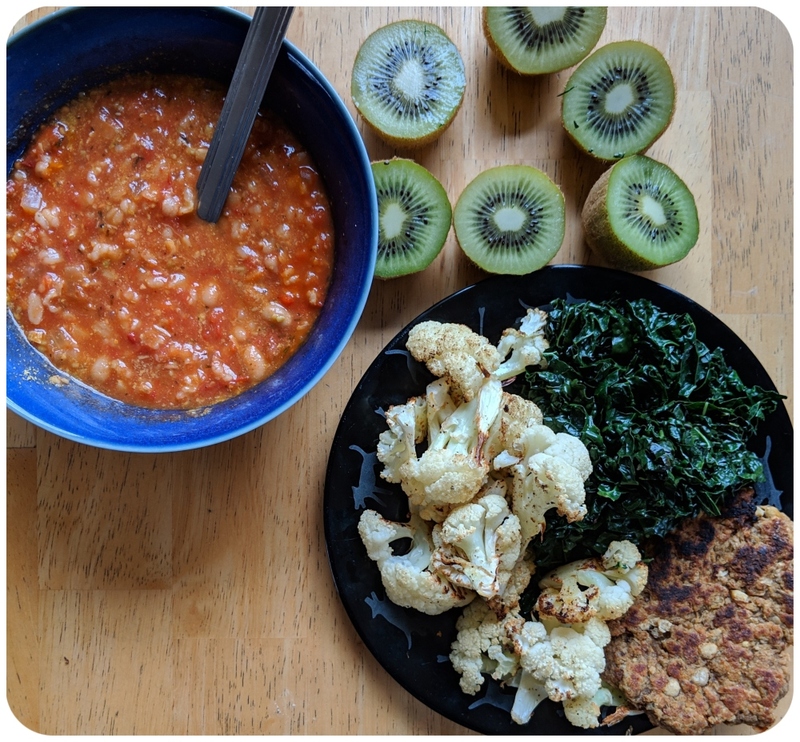 I had some leftover soup for lunch with sauteed kale, a Chickpea Cutlet, some roasted cauliflower, and some kiwis that my friend gave me. Ahhhh. I just love a huge, hearty lunch. I also made a big batch of stuffed shells... one of my all-time favorite foods! Stuffed shells are kinda like lasagna, but feel like less work. I used my own semi-recipe from this old post: I sauteed a couple huge leeks into a wonderful smooth texture, made a batch of tofu ricotta, sauteed/browned some mushrooms with some sherry... then I added a bit of nooch, extra sherry, and miso to the whole shebang. So good! 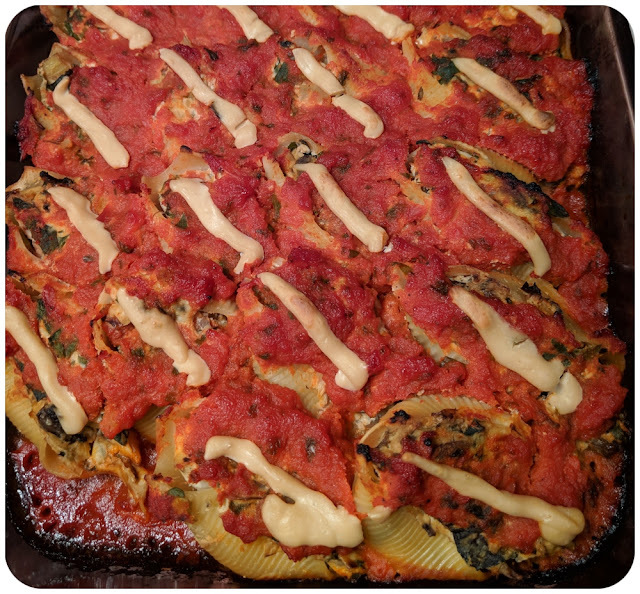 Mr. VE&T said this was my best batch of stuffed shells ever, and I think I agree! We don't eat out very often... I usually prefer cooking at home (or getting take out from our local Thai spot)... but one of my beloved yoga students gave me a tip-off that a local restaurant called Solaris had lots of vegan options on their menu. It was really good! AND they had TWO vegan appetizers (we chose the hummus plate), an appealing vegan entree (edamame cakes with veggies in curry), AND a vegan berry crisp for dessert!! It was so exciting that they even had a dessert! I can't remember the last time I ate out at omni restaurant that offered a vegan dessert. What a fun date night, we would definitely eat here again! 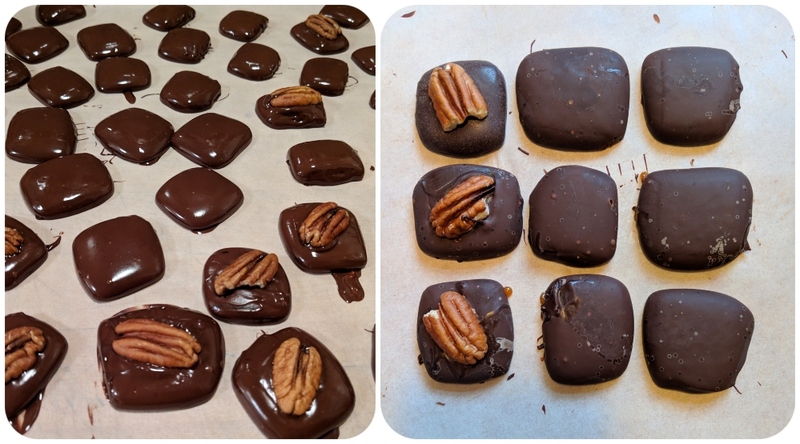 Lest you think I'm just eating soup and kale all day (ha ha ha), I also made some chocolate covered caramels! I used an old recipe that I printed out from the internet ages ago. Do you have a favorite caramel recipe? One of my pals had been struggling to make vegan caramel, so I told her I'd show her what I knew. Making candy is so weird... it requires so much faith and patience! Ours took FOREVER to get to temperature. The caramels came out with a great texture, perfectly gooey. I tried to make mine look beautiful with covered chocolate, but I messed up the tempering... so the chocolate also turned out unattractive. The caramel also gooed through the chocolate... I wonder why this happened this time? I know Lagusta of Lagusta's Luscious is coming out with a cookbook soon and I will be ALL OVER that biz. I'm sure she'll be able to give me some good tips for making my caramels more beautiful and perfect. In the meantime, these not-very beautiful caramels are certainly sufficiently delicious! 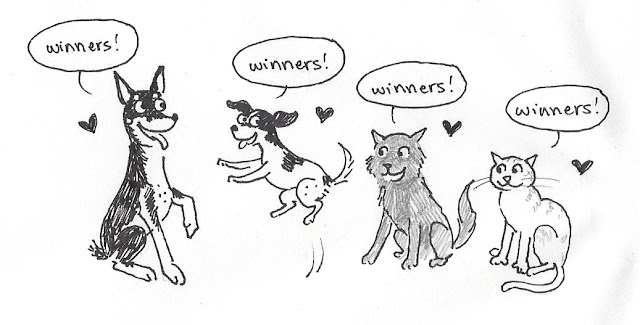 Congratulations to abrimmer, Sarra, vegan1, Beth, Joan, Hobbs, Jennifer (one-sonicbite), Liz S, Jacquie, Apricot, and Laurie! You're all winners of my annual Holiday Cookbooklette! so I can send you your cookbooklette! Potato soup looks yummy especially with the potato croutons on top. Rainy weather gives us permission to slow down. I love rainy weather, but we don't get much of it. But if I get to spend the day at home, soup and chocolate and pasta sounds ideal! YUMMY EATS...is RIGHT!!!!!! And congrats to the winners! First off I want you to know that I love your blog. But I have a question that is not intended to be snarky in any way. What in the world is "Madcap Cupcake?" It is on your bogroll but every time I try to read it, it makes no sense. It seems to be translated (poorly) from another language. Is this a blog you actually read and if so can you shed some light on... well... what it is? I'm very curious. Thanks!